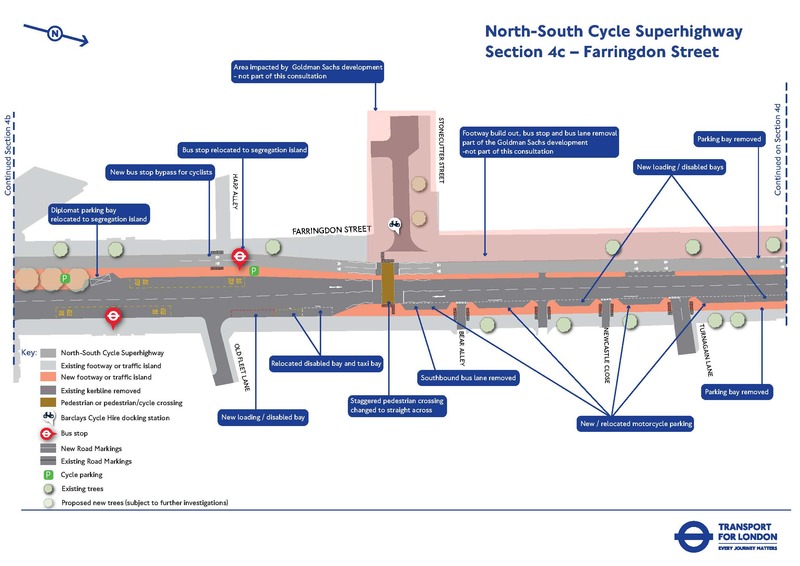 North-South Cycle super highway Elephant to Kings Cross – the death of ‘smoothing traffic flow’? Says the consultation page on the TfL website. Of course the big question is ‘What will happen to cyclists when they get to Kings Cross?’ Presumably even TfL wouldn’t just dump them into the gyratory. If i had to guess I would think they would route people to Argyle Street. ‘Smoothing traffic flow’ has featured prominently in the Mayor’s policy document since ‘Way To Go’ in 2008 and is enshrined in his full transport strategy. Feedback from cycling organisations and elected representatives suggest that this policy is frequently cited as a reason not to make improvements to road junctions that increase cycle safety. The implementation of this policy, which is intended to benefit cyclists too has failed and the policy has been mis-applied diminishing cycle safety. Which you wouldn’t have seen TfL fessing up to five years ago. They will be doing a more detailed analysis TfL says, so let’s see what emerges. Could be a big shift in the right direction. This entry was posted in Bad Gyrations KX Campaign, Transport and tagged cyclesafety, elephant, northsouth. Bookmark the permalink. 8 Responses to North-South Cycle super highway Elephant to Kings Cross – the death of ‘smoothing traffic flow’? I’m reserving judgement about whether this really is a big change of priorities for TfL – we’ll see – perhaps. But I don’t see that all motor vehicles need to be slowed by improving bike (and pedestrian) facilities – the answer, surely, is to take most of the cars off the roads of inner London, then you could have better space for human-powered movement without impeding buses and taxis (and essential commercial traffic). Funnelling cycle traffic into the main Kings Cross intersection from a North-South cycle superhighway would be crazy. Islington and Camden Councils have been united in our opposition to a route that just goes up Grays Inn Rd and feeds cyclists into the Euston Rd/Pentonville Rd/York Way chaos. That junction has too much of everything already: vehicles, pedestrians, cyclists. What’s more, the volume of pedestrians will keep on growing. Instead, what’s needed is a “quiet” route that bypasses KX for cyclists going further north or south of KX. Both Councils are working with TfL (we’ll see if this is going to yield results quite soon) to remove the gyratory and fundamentally reduce traffic volumes. We’ve made a start: the Caledonian Rd section of the north gyratory is being engineered back to 2-way-traffic right now. That’s good to hear Paul let us know when it bears fruit. I am using the Ossulton Street route, West of the British Library at the moment to bypass KX when coming from the South. It’s ok (though very bumpy) and hard to find from the South unless you know where you are heading. But to connect back to the Islington side I have to shoot up Goods Way which with the construction works isn’t a great route at present. Firstly, though some long-distance north-south cyclists might usefully be routed past Kings Cross intersection rather than through it, for many of us Kings Cross (or very nearby) is where we’re gong from or to. And also there are the very many east-west cycle journeys which go through Kings Cross. In other words, routing some north-south traffic away from the intersection/gyratory doesn’t get rid of the need for the intersection itself to be people-friendly (including cyclist-friendly)! In fact, I worry that re-routing (in a high-profile way) just a minority of the cyclists who currently go to or from or via Kings Cross away from the intersection will give planners an excuse not to humanise the immediate area itself for all of us. If _that_ were done, then a diversionary route would be less relevant. And in response to Paul’s “That junction has too much of everything already: vehicles, pedestrians, cyclists”, I disagree. It doesn’t have “too many cyclists and pedestrians”, they’re/we’re mostly people with good reason to be there. It _does_ have too many vehicles, which don’t need to be there. Take most of the private cars away, and ensure that commercial/delivery vehicles are a more appropriate scale for central London, and there’s plenty of room for us people! And the idea that the two councils can work with TfL to “fundamentally reduce traffic volumes” – great – but, by definition, only possible if some of the traffic in Kings Cross is got rid of. So is TfL finally going to switch its policy and throw out some of the (motorised) traffic? Wonderful if true – but if not, then this hope is cloud cuckoo land [in the generally misapplied sense of the term, not in Aristophanes’s original sense]. And I suspect not, of course – as per my point in my earlier message (yesterday) above. And also, Paul, what is the new 2-way section of Cally Road going to do for cyclists? Nothing, as far as I can tell. I see no suggestion of segregated cycle lanes each way. I see less bus lane infrastructure (which at least provides some help for cyclists). (Just extra traffic fumes from queuing traffic outside the new cafe frontages on Cally Road.) What was so obviously needed was to leave it one-way for everything except buses, bikes and taxis (or maybe even for everything except bikes), with segregated space for what was allowed both ways, and wider pavements. The fetish for always switching to two-way working on main roads (when there are other ways to slow traffic down, with the political will to do so) is misplaced. Minor roads generally need to be two-way as a better way of deterring traffic, but the argument isn’t always logical on heavily used roads. Which brings us back to the need to get rid of some of the traffic completely. But without that being done, the 2-way section of Cally is, it seems to me, a massive waste off funds which could be put to far better use by Islington – and goodness knows Islington are short of money. Sorry about a couple of typos just now, in my haste [I’m crashing my own deadlines here…]. But I don’t know how to correct them after I’ve submitted my piece/rant. Albert repeats the worries of those of us living in Caledonian Road that the two way working will increase the frequency of standing traffic outside our homes and businesses as two southbound lanes are squashed into one, not good for our physical or mental well-being. As I understand it, when the whole gyratory is done away with, north bound traffic in Grays Inn Road will be able to access Caledonian Road via Battle Bridge Road. What joys this will bring we cannot tell at the moment, but it might raise the opportunity for a dedicated cycle route at least in the northerly direction?